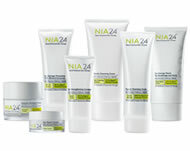 NIA24 is my favorite skin care line. When I was in my 20's I really didn't do anything special to take care of my facial skin. Now that I'm older I'm paying the price of neglectfulness to my pretty face. My skin was starting to develop brown skin, uneven skin tones, and fine lines. That's when I started the rounds of chemical peels, and seeking out the best skin care products. I found NIA24. It saved my skin. It has even out my skin tone, slowly removed the brown spots including my freckles, and repaired my fine lines. It's given me my pretty skin back, and it's made me feel as youthful as I feel inside. I would highly recommend this product to anyone serious about repairing their facial skin damage, and protection.